A little more than two years ago, I had the incredibly special experience of visiting my good friend William’s home in Birney, Montana. First block break sophomore year, four friends and I drove up to his family’s ranch in Birney, Montana, population 108, to visit with his family and experience their land and their way of life. To say Birney is rural is an understatement. The nearest grocery store is in Ashland, a slow, two-hour car ride away on sharp Montana shale dirt road. There are no stores in Birney. There are barely people. And for the few people who do call Birney home, most of them stick to themselves, tucked away in their small homes on their massive pieces of land, living the independent and elusive lifestyle so characteristic of the Big Sky Country. 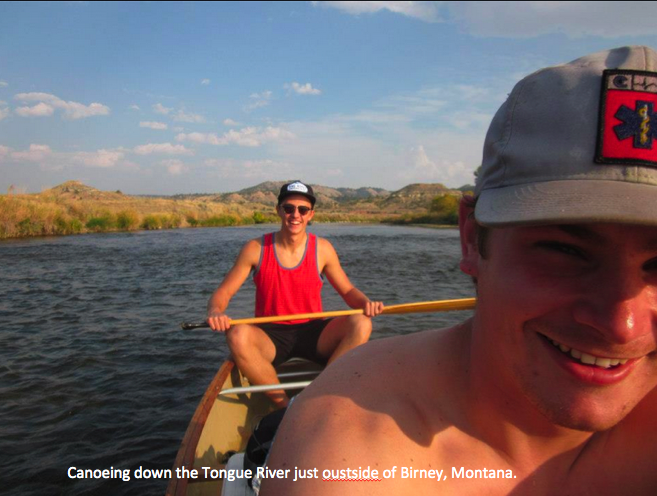 While in Birney, we spent a day floating the Tongue River on two old canoes that we were able to round up from one of the their neighbors. The Tongue River, a tributary of the Yellowstone River, flows around 265 miles from northeastern Wyoming to southeastern Montana, passing directly through the town of Birney. Charlie, William’s dad, dropped us off in Birney and told us that he would see us in 8 hours, 15 miles down the river at the next place where the river intersected the road. The stretch of the Tongue River we floated on that auspicious day is one of the most pristine places I have ever been in my life. I felt like I was a hunter from the Cheyenne or Lakota tribes, swiftly and quietly experiencing a landscape unbeknownst to humans before me. Exploring what appeared to be unchartered territory, I saw exactly zero people, zero signs of humans, and more wildlife than I could have dreamed of. A coyote trotting over a high point in the river, a stone-faced buck on the river’s bank, a huge soaring owl, an eagle, hawks, crows, and literally thousands of fish swarming the clear depths of the Tongue presented themselves during the float. Seeing such a pure, uncontrived landscape, so unaltered by man that imagining human activity was nearly impossible, a feeling of awe and reverence for this land was evoked from deep within my heart. The Tongue River became sacred to me on that day when the landscape the animals and the plants presented it as so. The words of Eliade describe this feeling well: “the sacrality of a place is revealed by animals” and that “men are not free to choose the sacred site, that they only seek for it and find it by the help of mysterious signs. [i]” me, the mysterious signs lay in the fabric of the untouched beauty of pure, unadulterated landscape. The federally recognized Northern Cheyenne Tribe resides on the Northern Cheyenne Indian Reservation just West of Birney. Their western border is the Crow Indian Reservation and the eastern border is the Tongue River. The geologic region is the northern edge of Powder River Basin. Massive coal deposits define the Powder River Basin, an area encompassing 24,000 sq. miles that stretches from northeastern Wyoming to the southeastern corner of Montana. Arch Coal, the nation’s 2nd largest coal producer, has been and continues to fight for the building of a coal mine just North of the Northern Cheyenne Indian Reservation. Since 1980, they have been fighting the ranchers, the Indigenous, and all the stewards of the Trout Creek Valley in their effort to build a strip mine on the northern edge of the Powder River Basin. Their plan includes one of the biggest coal mines in the United States, as well as a railroad that would follow the Tongue River to transport the coal. Because the climate right now in the United States is so hard for coal, due to environmental regulations, permitting fees, and the rise of natural gas and renewable energy resources as a cheaper and more efficient energy source, the Otter Creek’s potential market lies entirely in China. In order to get the coal to China, it has to pass from Montana through Washington to Seattle, the final American location before it would disembark on a 5,000-mile journey across the Pacific Ocean to Chinese coal-fired power plants. The majority of the residents living in the Trout Creek valley, the people who face the possibility of having a coal mine and rail system in their back yard, are in stark opposition to the idea. The Northern Cheyenne are no exception. They see the Tongue River and the surrounding animal and plant communities as sacred, a place inherently valuable in its existence, but also as a means to intimately connect with nature and their way of life. At the heart of the Northern Cheyenne tradition, is the idea that in order for man to survive, and for harmony and balance to ensue between man and nature, renewal through regeneration must occur. [iii] Building a coal mine and train through the little land they have rights to would entirely undermine this philosophy. North Cheyenne people are in favoring of renewable resources and respecting Mother Earth and the Great Spirit, decidedly choosing their belief system over corporate profit. 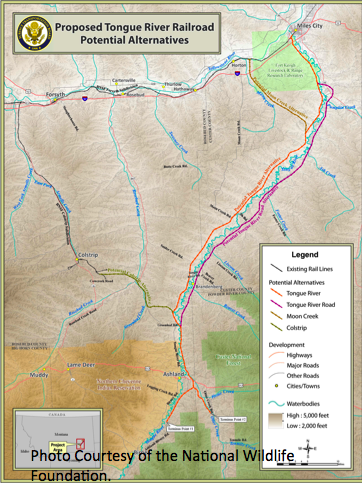 While Arch Coal owns the land of the proposed Otter Creek Mine and has eminent domain for the proposed Tongue Creek Railway, the final say comes down to the Surface Transportation Board (STB) and their analysis based on the Environmental Impact Statement as well the conclusions the board makes based on the numerous public hearings. 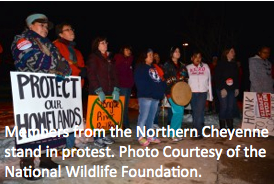 The US government and the STB have a moral obligation to the Northern Cheyenne community to say no to the proposal. Aside from their sacred connection, this is the land that the Northern Cheyenne fought for and were finally relocated on. To build a coal mine and desecrate that land would be the ultimate slap in the face to the Northern Cheyenne Indigenous population. Considering the United States Government’s history with Indigenous communities, while it’s hard to imagine, it would not surprising if the proposed mine succeeded. Though, I know the resilience of these communities and their power to stand in solidarity when faced with overwhelming challenges, and the Otter Creek Mine and the Tongue River Railroad is no exception. [i] Eliade, Mircea, and Willard R. Trask. “Sacred Spaces and Making the World Sacred.” The Sacred and the Profane: The Nature of Religion. New York: Harcourt, Brace, 1959. N. pag. Print. [ii] Marquis, Thomas Bailey, Margot Liberty, and John Woodenlegs. A Northern Cheyenne Album. Norman: U of Oklahoma, 2006. Print. [iii] Hoebel, E. Adamson. The Cheyennes: Indians of the Great Plains. New York: Holt, 1960. Print.